WASHINGTON (AP) -- The risk that an earthquake would cause a severe accident at a U.S. nuclear plant is greater than previously thought, 24 times as high in one case, according to an AP analysis of preliminary government data. The nation's nuclear regulator believes a quarter of America's reactors may need modifications to make them safer. The threat came into sharp focus last week, when shaking from the largest earthquake to hit Virginia in 117 years appeared to exceed what the North Anna nuclear power plant northwest of Richmond was built to sustain. The two North Anna reactors are among 27 in the eastern and central U.S. that a preliminary Nuclear Regulatory Commission review has said may need upgrades. That's because those plants are more likely to get hit with an earthquake larger than the one their design was based on. Just how many nuclear power plants are more vulnerable won't be determined until all operators recalculate their own seismic risk based on new assessments by geologists, something the agency plans to request later this year. The NRC on Thursday issued a draft of that request for public comment. 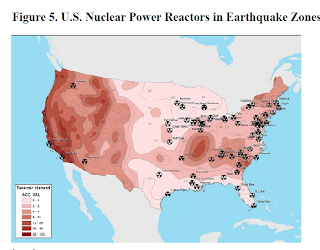 The review, launched well before the East Coast quake and the Japan nuclear disaster in March, marks the first complete update to seismic risk in years for the nation's 104 existing reactors, despite research showing greater hazards. ProPublica, Sep. 1, 2011, 4:12 p.m. The Securities and Exchange Commission is probing whether gas companies have exaggerated their reserves and haveadequately disclosed the risks to investors from drilling's potential environmental damage. New York Attorney General Eric Schneiderman has requested similar information from several companies. The list features both "integrated" oil-and-gas giants, such as Exxon Mobil, which refines and sells gasoline around the world, and "independents," such as Chesapeake Energy, which are primarily in oil and gas exploration and production. Thoughindustry P.R. initiatives often emphasize independent mom-and-pop drillers, most of the companies on our list are Fortune 500 corporations. More than 90 percent of Devon's U.S. reserves are in natural gas, with most of that lying in Texas' Barnett Shale. Like its peers, however, Devon says that this year it will focus on drilling in areas rich with oil and other liquids. The country’s push to find clean domestic energy has zeroed in on natural gas, but cases of water contamination have raised serious questions about the primary drilling method being used. Vast deposits of natural gas, large enough to supply the country for decades, have brought a drilling boom stretching across 31 states. The drilling technique being used, called hydraulic fracturing, shoots water, sand and toxic chemicals into the ground to break up rock and release the gas. Does an Old EPA Fracking Study Provide Proof of Contamination?